With four games left in the regular season, Terriers begin a pair of crucial home games against Vermont tonight. Puck drop at Agganis Arena is 7:30 p.m. BU is in sixth place in Hockey East, but just two points out of the top spot. 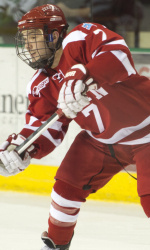 The Catamounts, who dropped a 6-2 decision to BU in Burlington last November, have won only seven Hockey East games (7-11-5), but are playing their best hockey of the season. They’re 4-2-1 over the past seven games including an overtime tie and one-goal loss to New Hampshire last weekend. Vermont’s top scorers are senior Chris McCarthy (24 points) and sophomore Jacob Fallon (19), a transfer from Michigan. Freshman goalie Brody Hoffman has a 2.72 GAA. Sophomore Cason Hohmann (photo), who has nearly quadrupled his freshman point total, tops the Terriers with 29 points. Three Terriers with hot sticks lately are junior Matt Nieto, with five goals in the past five games, sophomore Evan Rodrigues and freshman Danny O’Regan. Rodrigues and O’Regan each have 16 points over the past seven weeks. Freshman Sean Maguire, who earned his first win of the season against Vermont, will get the start in goal tonight. ► Terrier Coach Jack Parker will be honored during Saturday’s game for his 40 seasons behind the BU bench. Fans attending the game will receive a commemorative puck. ► Episode 19 of Inside BU Hockey features Bernie Corbett’s interviews with Coach Jack Parker, goalie Matt O’Connor and Mark Krys, captain of the BU’s 1991 NCAA finalist team. The fourth renewal of Red Hot Hockey, matching BU and Cornell is New York’s Madison Square Garden, will take place on Nov. 30, 2013, the Saturday after Thanksgiving. Tickets are now on sale for the event. While BU’s 2013-2014 schedule is far from complete, it will feature home games with perennial Western powers North Dakota and Wisconsin. Posts on USCHO have indicated that the Terriers will visit both Michigan and Michigan State next season. 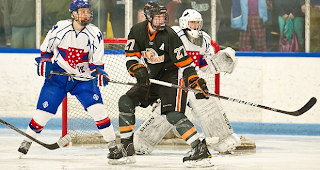 2013 recruit Doyle Somerby (photo courtesy of Dave Arnold Photography) scored the only goal for Kimball Union, which was upset by Gunnery, 4-1, in the quarterfinal round of the New England Prep School Tournament. The Wildcats, who were the top seed in the tournament, finished the season at 28-3-0. Somerby, a 5th round draft choice of the Islanders in 2012, captained the team. With his prep season complete, Somerby reportedly may join the USHL Muskegon Lumberjacks, who selected the left-shot defenseman from Marblehead, Mass., in the 2012 USHL entry draft. It was a “Three Dog Night” in Anaheim this past Wednesday with a trio of ex-Terriers on the ice: Colin Wilson and Brandon Yip for the visiting Predators and Nick Bonino for the host Ducks. Only Bonino made the score sheet in Anaheim’s 5-1 blowout, benefitting from some puck-handling hesitation by the Nashville goalie to get the Ducks on the board just three minutes into the game. Senators’ blueliner Eric Gryba played his first game at TD Garden since the 2009 Hockey East Championship game in Ottawa’s 2-1 loss to the Bruins. #4 Terriers begin their quest for a third Hockey East tournament title on Saturday afternoon at Walter Brown Arena with a quarterfinal game against Connecticut. Puck drop is at 3 p.m.